Mars Researcher Alfred Webre Banned on Facebook! In-Q-TEL’s primarily invests in new Data Mining Technologies. So Facebook is a CIA surveillance device used for data mining. And Alfred Webre has been an even bigger thorn in the CIA’s side for the massive expose’s he continues to publish. Webre is like a terminator. He doesn’t compromise. He doesn’t turn back. He doesn’t negotiate. He doesn’t stop. 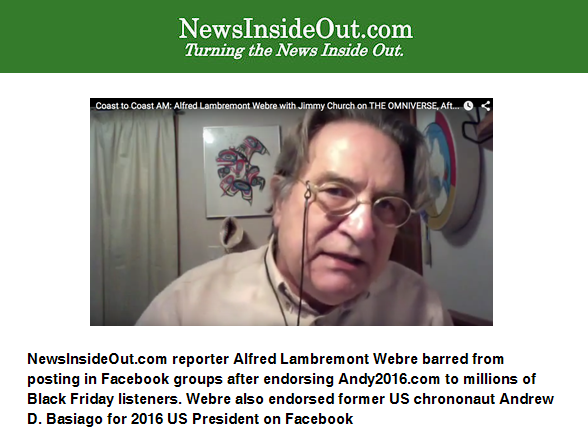 VANCOUVER, BC – NewsInsideOut.com reporter Alfred Lambremont Webre barred from posting in Facebook groups after endorsing Andy2016.com to millions of Black Friday listeners. Webre also endorsed former US chrononaut Andrew D. Basiago for 2016 US President on Facebook. Facebook’s action at about 1:00 AM PST on Saturday Nov. 28, 2015 came less than 2 hours after Webre endorsed fellow attorney and former DARPA and CIA chrononaut Andrew D. Basiago for US President in 2016 – www.andy2016.com – before millions of listeners on Coast to Coast AM radio show hosted by Jimmy Church. The radio show was to launch Webre’s new book on THE OMNIVERSE. 5. None of the information in my posts can reasonably be considered as “unsafe” or making Facebook or its members “unsafe” or threatening the safety or well being of the members of groups I belong to and post in. 1. Facebook – Post copies of this article widely in Facebook groups to show support of freedom of speech on Facebook. 2. Andy2016.com – Share Andy2015.com widely on Facebook and donate even in small amounts of $1 or $5 or $10 at www.andy2016.com.